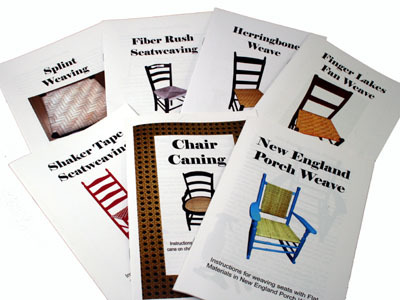 This extremely useful set includes 1 each of all 7 of our excellent seat weaving instruction booklets: Splint Weave, Fiber Rush, Herringbone Weave, Finger Lakes Fan Weave, Shaker Tape Seat Weaving, Chair Caning and New England Porch Weave. If purchased separately, these cost $27.65. Many illustrations, and very clear step-by-step instructions in each. Booklet size is 5.5" x 8.5".